Iowa State scientists have developed a working battery that dissolves and disperses in water. Larger image. Scientific illustration by Ashley Christopherson. AMES, Iowa – Self-destructing electronic devices could keep military secrets out of enemy hands. Or they could save patients the pain of removing a medical device. Or, they could allow environmental sensors to wash away in the rain. Reza Montazami, an Iowa State University assistant professor of mechanical engineering and an associate of the U.S. Department of Energy’s Ames Laboratory, has been working on transient technology for years. The latest development from his lab is a self-destructing, lithium-ion battery capable of delivering 2.5 volts and dissolving or dissipating in 30 minutes when dropped in water. The battery can power a desktop calculator for about 15 minutes. The battery itself is tiny – about 1 millimeter thick, 5 millimeters long and 6 millimeters wide. Montazami said the battery components, structure and electrochemical reactions are all very close to commercially developed battery technology. 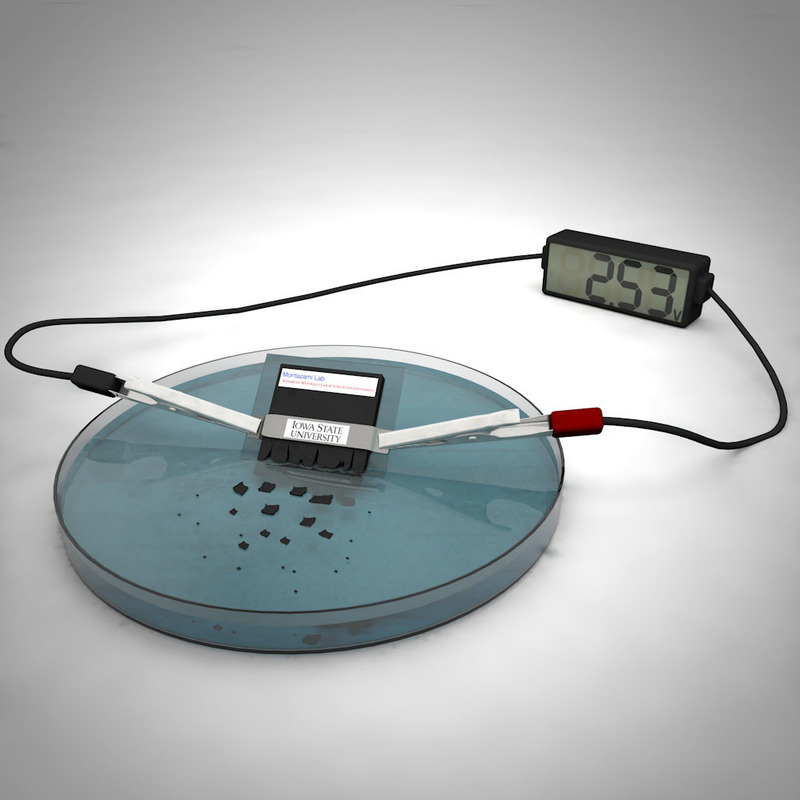 Reza Montazami and his research group have developed a working battery that self-destructs in water. It's part of a field of study called "transient electronics." Montazami said the battery project presented many challenges, including a complex structure and difficulties in fabrication. The team's findings were recently published in a polymer physics journal.